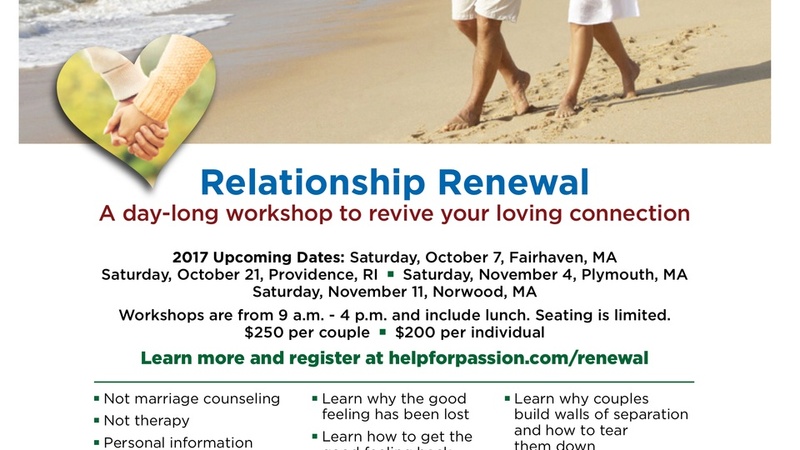 A workshop series offered in multiple locations around Southern New England with the focus on love, relationship, health, satisfaction & reconnection. Workshops for couples to repair and deepen loving connections. Andrew Aaron, LICSW will present material uncovering the many causes of disconnection between spouses and long-term romantic partners, but will guide participants to assess personal relationship needs.He will also facilitate vital and deep communication between partners to spark the necessary change for relationship and marital improvement. Opportunities within the workshop will allow for specific questions to be asked. Sharing of personal information is not necessary. Multiple methods for asking questions will allow for anonymity, confidentiality and privacy if desired. Participating couples need not interact with other couples. This a love-based workshop and is not religiously affiliated. Participants do not have share; are not required to speak publicly, interact with other couples. Questions may be asked anonymously in several ways: publicly, anonymously written, or by text message. Cancellation and Refund Policy: For full refund cancel your reservation one week or more prior to the workshop. Cancellation between seven and two days prior to the workshop and a $25 cancellation fee is deducted from the refund. No refund for cancellation within 48 hours of the beginning of a workshop.